As we enter the final week of the season, each crew will be recounting some memories and highlights from their season from each crew members and leader’s perspective. These will come in the form of pictures and stories from both their work completed and their time in Colorado. 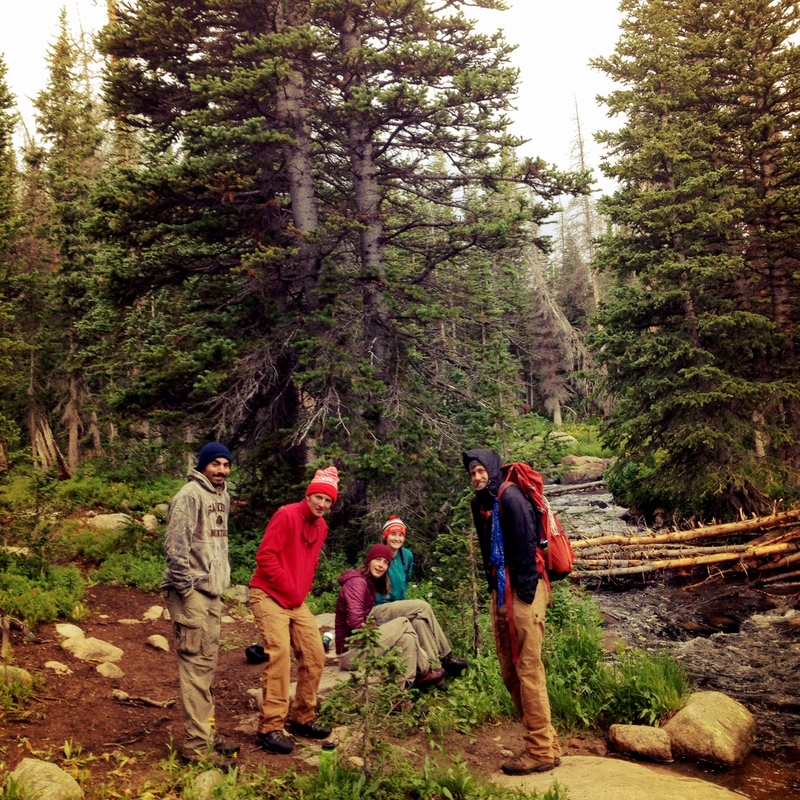 First up for the week is the Rawah Wilderness Crew! Favorite Memory: Going along with my favorite photo, our first backcountry hitch on the Big South Trail was one of my favorite work adventures. The trail was challenging and mosquitoes quite vicious but hiking along the Poudre River Canyon provided us with some unforgettable views! 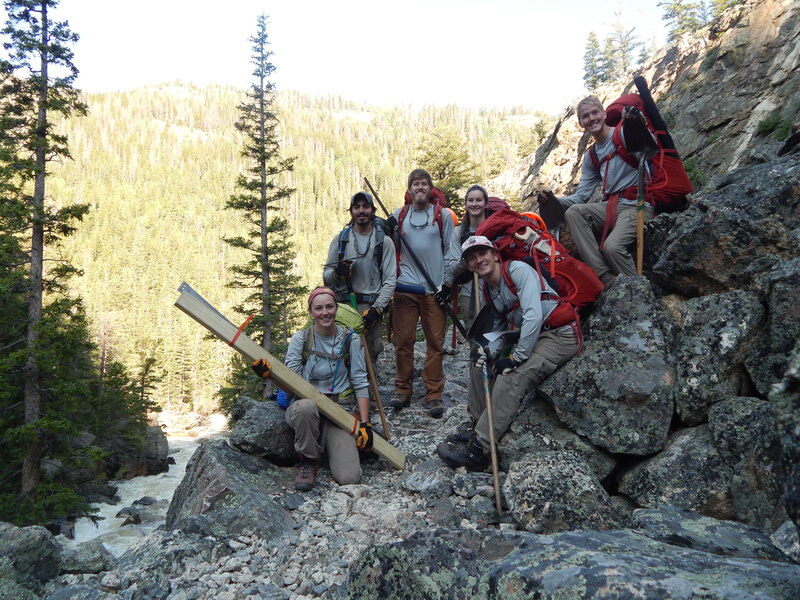 Favorite Work Project: The Rawah crew did trail maintenance on most of the trails in the Rawah Wilderness, so we didn’t devote a ton of time to project work. With that being said, we were able to build a few rock walls on the Roaring Creek Trail, which was really rewarding. The trail was rather steep and rocky with few drains, which likely caused the eroded sections. Hopefully our work will make the not so friendly trail safer and easier to travel!! One of my favorite parts of doing trail work is cross cutting fallen trees off the trail. This moment was captured on the McIntyre Trail in the Rawah Wilderness. Favorite Memory: Over the course of this summer, the majority of our work weeks took place camping in the back country of the Rawah wilderness. My favorite experience cannot be narrowed down to one moment but a several. At the end of almost every trail we worked we either reached a mountain lake, peak or pass that were all breath taking and special in their own ways. Reaching these sought out for destinations made our long work weeks feel that much more rewarding. Favorite Work Project: My favorite project this summer was building water bars which would act as a funnel to channel water off the trail. While we could not see the functionality of the water bars when we first installed them, as the summer continued and we revisited some of the trails we could see that our water bars were indeed working. One in particular was a water bar I built with Gus Waneka on the McIntyre trail. When we hiked by it several weeks after building it, it looked like it’s been there for years and it was a reassuring sign that it would be there for years to come. This photo took place on a backcountry trip up to Twin Crater Lakes in the Rawah Wilderness. Geoff was able to join us on this day of trail work. Nothing especially remarkable happened on trail that day, but the photo captures our hike leading up to an incredible area of the Rawah Wilderness. 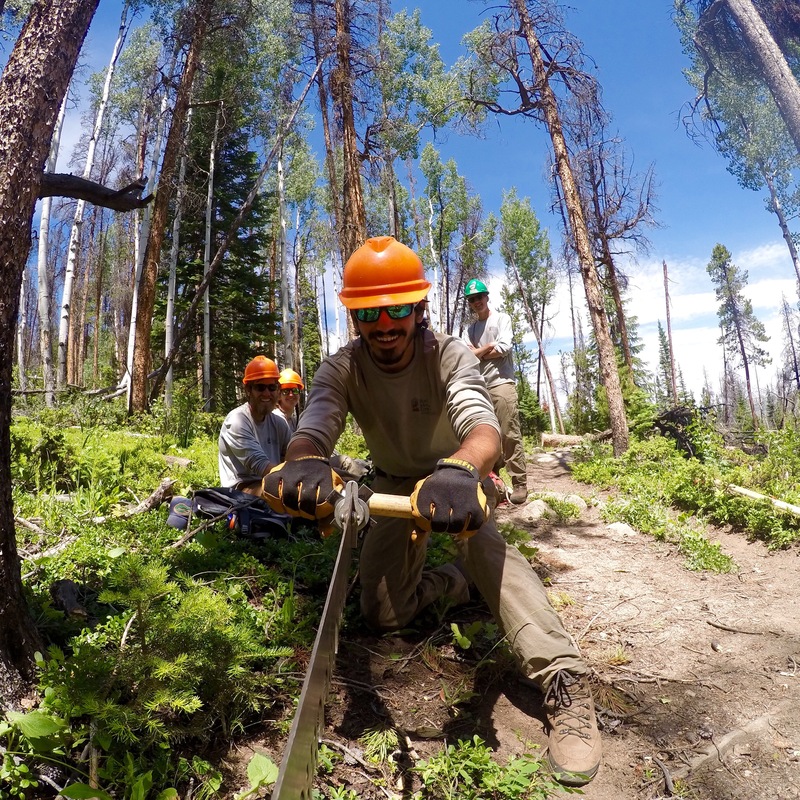 I think the photo captures the essence of our crew and the Rawah Wilderness while also displaying the beauty of our everyday job this summer. Favorite Memory: My favorite memory of the summer was jumping in Blue Lake with our crew in the Rawah Wilderness at the conclusion of our final day of trail work. We actually worked a different portion of the Blue Lake trail at the start of the season in June when much of the upper part of the trail was covered in snow and the lake was still covered in ice. I really enjoyed this day early in the season because it was the first time we had worked a trail up to a beautiful alpine lake. I never expected to return to Blue Lake during work, and it seemed fitting that we concluded our season by jumping into the now thawed lake as a crew. 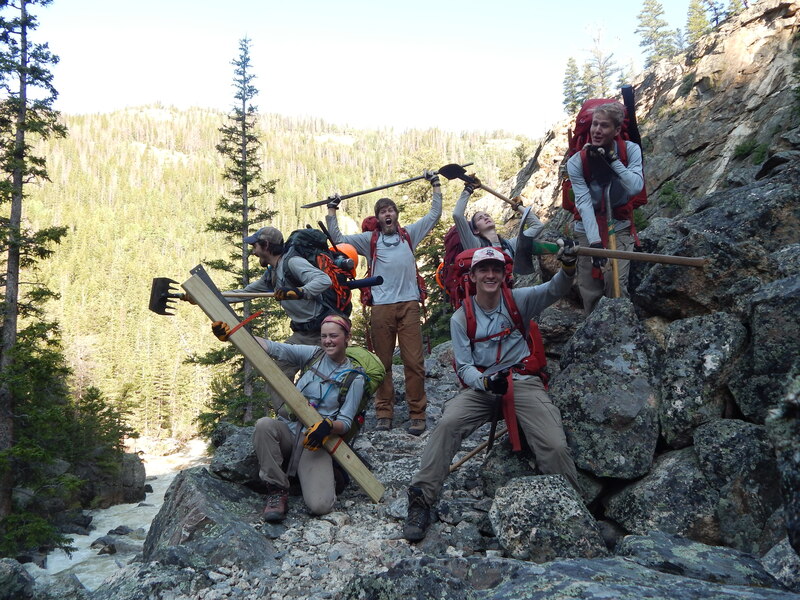 Our crew become close friends while working in the Rawah Wilderness, and jumping into Blue Lake as a conclusion to our summer’s work will always be a lasting memory of the great times we shared together while maintaining trails. 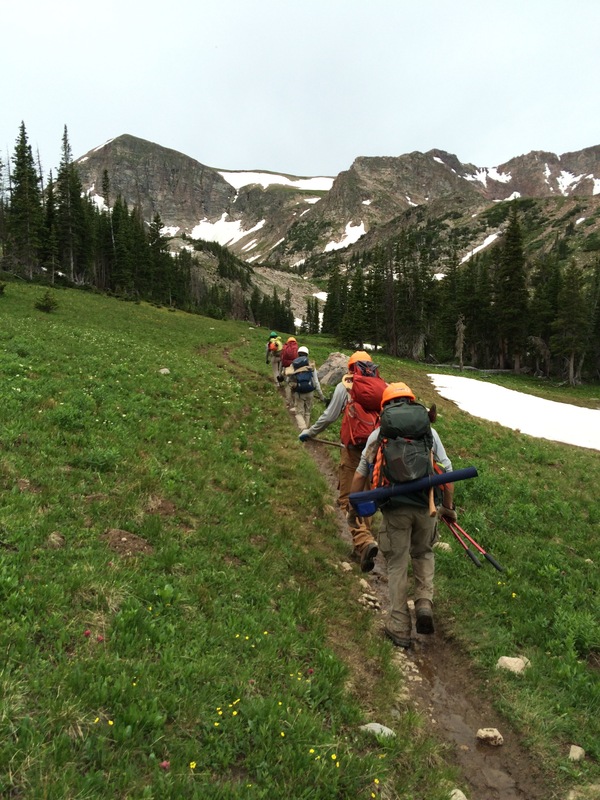 Favorite Project: My favorite project I completed this summer occurred on the Medicine Bow Trail in the Rawah Wilderness. The project involved clarifying the trail corridor in a section of trail immediately close to a creek crossing that had become overgrown to the point where it was nearly impossible to identify where the trail led. In fact, on a recreational weekend hike I took with my fellow crewmember Gus Waneka earlier in the season, we got lost at this section when we couldn’t find the trail after crossing the creek from the other side. It was snowy and wet at the time of the recreational hike in mid-June, but I still immediately recognized the area where we had lost the trail. I really enjoyed digging a new trail, especially given the frustration I had personally experienced in getting lost at this junction earlier in the summer because of an unclear corridor. The personal connection I held with this section of trail made the work we did to clarify the trail corridor all the more fulfilling because I knew fellow hikers in the future will not become lost as Gus and I had in June. Favorite Memory: It was our first entirely backcountry hitch after mid-week and we headed out from the West Branch trailhead. On our last day we headed up towards Carey Lake, which is in alpine. We worked up the trail and were planning on making and enjoying our dinner when we got to the lake later that day. Once we made it to Carey Lake we began to set up for dinner and a huge storm cloud rolled up on top of the ridge above the lake. There hadn’t been any thunder so we had no idea it was coming and weren’t sure if it would actually culminate in a storm. We began to pack our things and decided since we were above tree line it was better to head down as opposed to waiting to see what happened. We were putting our raingear on when it started to hail and it was time to start moving. 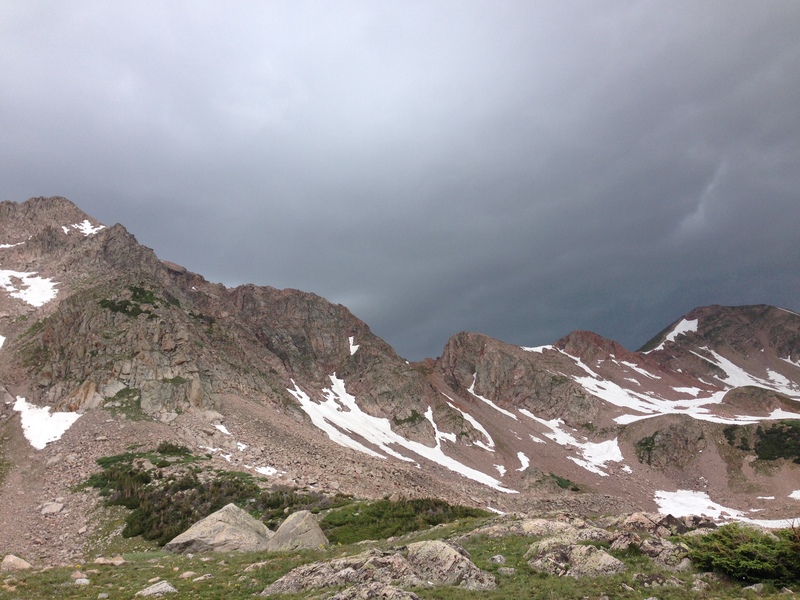 We were making our way out of the alpine when we heard a huge clap of thunder right above us, which prompted us to get low and run. We made it down below tree line before we heard any more thunder and the rain wound up holding off for the rest of night and we made dinner along a creek down the trail. This was my favorite experience because of the way we worked as a crew together, even though we were not doing trail work, it still involved making quick decisions and we didn’t let the weather dampen our dinner. Favorite Work Project: My favorite project was on the McIntyre trail where there was a section of trail that had been flooded out from river runoff. It was our first big project as a group and we went back to it a couple of times to see if what we had done to keep the water off was holding and the build up the trail from where the water had rutted it. At first we built a rock wall where the creek was flowing onto the trail to keep the water off it, then we drained the standing water from the trail back into the creek about 20 feet down trail from the wall. This took a significant amount of time because the water was so high from snow melt at the beginning of the season a lot of work had to go into making sure the wall would hold. The next hitch we went back and added rock checks and built up the trail where water had rutted out the dirt, making it difficult to walk on and very dangerous for stock to travel on. This was my favorite project because it was our first opportunity to work on trail as a crew and start learning about how things were going to work for the rest of the season. The project went really well and the wall is still holding and although our first project may have not been our strongest, it was a great learning building experience. The crew being a little goofy while hiking out from our first 3 day back country trip of the season on the Big South Trail. Favorite Memory: My favorite moment of the season was the first back country trip that we took. It was pretty early in the season, however I had been waiting since I was accepted to the program to get back out to Colorado and do some back country trail work on the Big South trail that runs in a canyon along the Poudre River. The trail is 7 miles long, and we spent the first part of our first day hiking into the trail about halfway and setting up camp and one of the many designated camp sites. The trail is pretty remote, but throughout the trip, we saw a ton of people out enjoying hiking and fishing along the trail. It was a really great first backpacking trip of the season that I had been waiting quite a few months to go out on. Big South was a beautiful trail to work, following the Poudre River all the way up the canyon, with lots of awesome wildlife flowers and wildlife along the trail as well. On our joint backpacking trip with the Red Feather crew, we set up a base camp right before the trail forked off. Right before the fork there was a broken bridge over a creek that was quite unstable that we crossed everyday working the trails. On our last day of the 4-day trip, a group of us stayed behind to repair the bridge. We spent the morning crosscutting a few trees and gathering rocks to make steps and wedge the logs together and make snug. After some puzzles with getting the rocks to fit and finding the right place on the creek to put the almost too short logs, we got the bridge stabilized and wide enough to cross safely. It was the first major project of the season that I had done, since a lot of my crews work included general trail maintenance (clearing drains and trees as well as tread work). It was pretty cool seeing it go from just a few flimsy logs across a creek to a quite stable bridge that will hopefully last for quite a few years! This photo is one of my favorites. In this photo the crew is boiling water on a very cold morning in the backcountry. I love this photo because it shows our crews ability to make the best out of every situation. Even though our water filter had just broken, we were all thirsty and tired, and the temperatures were frigid, the crew was upbeat and joyful about the work day ahead. Favorite Memory: This summer I learned how to fly fish. In the Rawahs, I had plenty of opportunities to fish in both rivers and mountain lakes. I really enjoyed spending time on the beautiful Laramie River in particular, where I was able to catch some larger rainbow trout. My fellow crew members who fished were great resources for learning and were all eager to help me hone my skills. I’m glad I have had the opportunity to fish as much as I did this summer and I hope that fly fishing will be a hobby for the rest of my life. Favorite Work Project: My favorite project this summer was getting to complete tread work on the West Branch and Rawah trails. As a Fort Collins local, I’ve had ample opportunities to hike these trails over the years and they are some of my favorite in the state. It felt good to work on the trails that have carried me over miles of good memories. I know that when I hike these trails in the future I will always remember all the hard work I did to make them better.